Jones, S. C. & Reid, A. (2010). Children's magazines: reading resources or food marketing tools?. Public Health Nutrition, 13 (3), 393-399. Copyright Cambridge University Press. Objective: Magazines targeted at children under 12 years old are growing in popularity; past studies have asserted that food items are rarely exposed, but methodological issues may have covered the true extent of covert promotion. 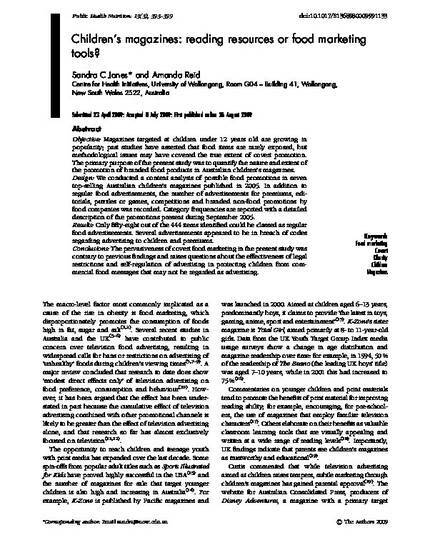 The primary purpose of the present study was to quantify the nature and extent of the promotion of branded food products in Australian children’s magazines. Design: We conducted a content analysis of possible food promotions in seven top-selling Australian children’s magazines published in 2005. In addition to regular food advertisements, the number of advertisements for premiums, editorials, puzzles or games, competitions and branded non-food promotions by food companies was recorded. Category frequencies are reported with a detailed description of the promotions present during September 2005. Results: Only fifty-eight out of the 444 items identified could be classed as regular food advertisements. Several advertisements appeared to be in breach of codes regarding advertising to children and premiums. Conclusions: The pervasiveness of covert food marketing in the present study was contrary to previous findings and raises questions about the effectiveness of legal restrictions and self-regulation of advertising in protecting children from commercial food messages that may not be regarded as advertising.